BEIJING — Usain Bolt defeated Justin Gatlin in the men’s 200 Thursday night at the 2015 world track and field championships, running the best time in the world this year, 19.55 seconds, to win hands-down. If the result of this big-time showdown had been the other way around, if Gatlin had won, would earthquakes and tsunamis roil the planet? Would sinkholes swallow up large towns? Meteors flash across the sky? Gatlin finished in 19.74. Just as he did in the 100 Sunday night, Gatlin lost his form — this time, about six steps from the finish — but managed to keep it together enough for second. What happened Thursday, same as Sunday, amounted to great sport and, no small thing, great theater. Bolt yet again proved his worth. And Gatlin proved he is a worthy rival. That’s great for track and field. Gatlin on Bolt: "I have nothing against Usain. He is a great competitor. A competitor as myself — you know, you look for that. You look to be able to get pushed to your limits, to get pushed to the best times you can run. "At the end of the day," Gatlin continued, "when you are like 45, 50 years old, and you retire, you want to look back and say, you know what? That guy right there, you helped make history with this guy, helped push him and he pushed you to be a better athlete." "I have no problem with Justin Gatlin," Bolt said. "He is a competitor." If Bolt doesn't have a problem with Gatlin, this simple question: why should anyone else? Bolt also said of Gatlin, "He talks a lot. I have noticed over the years. But that’s just who he is. I’ve noticed that in the lead-up to a championship, he’s going to say a lot of stuff. But after the championships, he confuses you, you feel like he is your best friend." Track and field too often can find itself in a marginalized niche, a once-every-two- or four-years-thing. The 200, and other events Thursday, offered precisely what the sport needs: big-time stars, and rivalries, and expressed respect. Allyson Felix, for instance, moving up from the 200 to the 400, exploded from the start in Lane 6 and put on a sprinting clinic to win in 49.26, a 2015 world-best time. Shaunae Miller of the Bahamas took second in 49.67, Shericka Jackson of Jamaica third in 49.99. The 400 victory made for the ninth world championship gold of Felix’s stellar career. Let the debate begin now in earnest about whether the schedule at next summer's Rio Olympics can be shuffled around so that she can run both the 200 and 400. In a news conference, Felix was asked the secret not just to her success but her longevity. Simple, she said -- "to be hungry, to be passionate" about sprinting and winning. In the triple jump, American Christian Taylor, the 2012 Olympic gold medalist, set a new American record, 18.21 meters, or 59 feet, 9 inches, in a competition that -- right before the women's 400 and men's 200 -- seemingly captivated everyone at the Bird’s Nest. That 18.21 is the second-longest jump in history. Britain’s Jonathan Edwards went 18.29, 60-0 1/4, in 1995. The American record had stood for 19 years: 18.09, 59-4 1/4, Kenny Harrison, to win Olympic gold in Atlanta in 1996. Second went to Cuba’s Pedro Pichardo, 17.73, 58-2. "It was a great fight," Taylor said. "I saved it until my last jump." The 2008 Olympic champ, Portugal’s Nelson Evora, grabbed third on his final jump, a season-best 17.52, or 57-5 3/4. The American Omar Craddock had to settle for fourth, 17.37, 57 feet even. As things got underway Thursday night, Bolt, announced to a huge roar, kissed the “Jamaica” on his jersey. Gatlin made kissing motions, then “ran” with his hands, also greeted by cheers. For all the noise about the 100, the 200 has long been Bolt’s preferred race. In Lane 6, he got out of the blocks without incident — he can be a slow starter but not Thursday — and then, coming down the stretch, powered home for the victory, the fifth-fastest 200 ever. The last time Bolt had run a 200 under 19.6? August 23, 2012. "The 100 is really for the people, for my coach," Bolt said, "and the 200 is for me." Earlier this year, Gatlin had run a 19.57. But not this night. That 19.74, however, is no small thing: it made for the second-fastest non-Bolt time ever at a world championships. The American Walter Dix ran 19.53 at the worlds in Daegu, South Korea, in 2011. Third place Thursday went to South Africa's Anaso Jobodwana. He ran a national-record 19.87. Bolt is also thoroughly charismatic. He has made “To Di World” a pose recognized the world over. Bolt got tangled up with a cameraman amid the post-race festivities. No harm, no foul, he said: "I'm fine. It's all fine." One, that he is running clean. The most, though, that anyone can say about Bolt that he has never tested positive. That is a long, long way from a guarantee of anything. To be clear, that's by way of explanation, not accusation; moreover, it must be stressed that nothing has surfaced that would link Bolt to anything undue. That said, when it comes to the Jamaican track and field landscape, no one, least of all in the media, can be assured of any guarantees; that's too much of an ask given the structural deficiencies that have plagued the Jamaican anti-doping infrastructure, and its woeful lack of testing over the years. The second point to consider: track and field is not, as some like the chief sports feature writer for the Daily Telegraph, the English newspaper, would have it, a moralistic reflection on athletic piety or purity. The history of the ancient Olympics in Greece makes that plain. Fast forward to Ben Johnson in Seoul, in 1988. And the BALCO scandal in the United States some 12 years ago. And allegations now about blood doping in countries around the world. Track and field, like any enterprise, has its good points — its very, very good points, indeed — and some not so good. Things in track and field, as in all spheres in life, are not simply susceptible to a reduction of good and bad, black and white, yes or no. If Bolt can be depicted as a hero — have at it, if you want to. The same, though, for Gatlin — for years, he has been a study in humility and courage, working his way back from the embarrassment and shame, indeed the mortification, of two doping positives. Redemption is just as powerful a lesson as anything, and for anyone. Who goes through life without mistakes? Gatlin’s agent, Renaldo Nehemiah, told the BBC, “He has humbled himself for months and months. It was never widely reported so people don't believe he has made amends or apologized." Late Thursday, Nehemiah in an interview, said, "Consider the woman who’s afraid the man who’s coming home is going to beat her -- she's reading all this, realizing [Gatlin] is a fighter, he’s standing tall. "That’s where the lessons can be learned. There are so many people who can look at this and say, wow, this guy has persevered through relentless criticism -- criticism that was heaped on him unfairly." To carry the inquiry further — if Bolt is the “saviour of the sport,” as the British track and field Athletics Weekly blared in its front-page headline after the 100, what would have been the case had Gatlin prevailed Thursday night? Would Bolt personally be to blame for any and all ills the sport might confront? Of course not. This is why the entire construct is not just completely absurd and over-the-top ridiculous but entirely unfair — to Bolt, to Gatlin and, moreover, anyone. Further, what gets lost in the depiction of Bolt as “good” or Gatlin as “evil” is elemental: facts. And with facts come context. In the real world, these things matter. Anyone in the public eye deserve these things, at the very least. Gatlin’s first positive test came in 2001, when he was 19, for prescription medicine he was taking for attention-deficit disorder. As for the second, a testosterone pop in 2006, it makes much more sense upon a read of the record — all of which is publicly available in a federal courthouse in Pensacola, Florida — to infer that the positive test may well have resulted from a shot or a pill, administered by assistant coach Randall Evans, the injection witnessed in person by coach Trevor Graham. Graham is of course one of the central figures in the BALCO case. There is no support in the record for the assertion that a massage therapist rubbed steroid cream on Gatlin. That theory, according to the documents, came from Graham. Facts. They really matter, or at least you’d like to think so. Why is any sort of “payback” a thing? Payback does not equal deterrence. That is simply illogical, it being a maxim of legal theory that sanctions exist for four purposes: retribution, incapacitation, deterrence and rehabilitation. Payback is not making someone a villain because it suits an easy narrative. That’s grossly unfair. At any rate, you want deterrence? Five to six million dollars and four years out, humbling yourself by teaching 8-year-olds in and around Atlanta how to run — that’s powerful deterrence. You know what else is important in reporting about these kinds of things? Consistency. Another high-profile sprinter who got busted in the BALCO scandal, as all familiar with track and field would know: the British star Dwain Chambers. After a lot of legal to and fro, Chambers was ultimately cleared again to run. Indeed, in the piece published Wednesday: "Any drugs cheats who decide to revive their careers must accept that it is their lot to endure a reception rife with suspicion and innuendo." “After the athletics season last year Chambers climbed Mont Blanc in support of the charity Teens Unite and he revealed the experience had given him the mental strength to keeping racing. ‘I’ve climbed many mountains, haven’t I? And fallen down a few,’ he said. ‘But I still keep standing. Climbing that mountain was for a different cause, but it showed me a lot about myself. That was a lot of pressure. I was scared, because any false slip I was a goner. I had to keep my wits about me. But doing that made me believe and understand that I can do anything. ‘I was totally out of my comfort zone, walking 250 [meters] up an hour. It normally takes me about 25 seconds to do that. But it was a real test of character for me and it’s given me the ability to still come out here and compete.’ "
Fair is, you know, fair. Recognizing what he was up against coming into this meet, Gatlin acknowledged late Thursday, "It was never my intent to come to these championships and and try win over any fans or change the view of who I am. My intent was to come here and compete to the best of my abilities. That's what my job is. "I think the people saw a different view of me: you know, I'm just a competitor, man. I have no ill will toward Usain, no ill will towards anybody. We have all worked very, very hard all season long, just trying to stay away from injury. And just get out there and run 9 seconds, run 19 seconds, and get on that podium. Mission accomplished. "I came out of here with some hardware," he said. Now it's time "to get ready for the 4x100 and get ready for Rio." Where Bolt and Gatlin, all things being equal, get to go at each other again. It's all good. BEIJING — Dear friends and colleagues in the media, especially many of you in the British press: back off. Cut Justin Gatlin some real slack. Instead of insight and the pursuit of the truth, what far too many of you have delivered instead is a simplistic caricature of events amid the 2015 world track and field championships that, regrettably, has led to the capacity to incite. This is not good, not good at all, and if something serious happens — the warning shot was a heckler calling out Gatlin’s mom, of all people, while he was on the medal stand Monday night — it’s on you, each and all of you, in your repeated exposition of a binary “good” and “evil” narrative to the men’s 100 meters. You don’t think such a thing is possible? Review violent events in tennis. All it takes is one crazy person. Two nights after the epic 100, won by Bolt over Gatlin by one-hundredth of a second, the two were back center stage Tuesday night for the heats of the 200, Bolt winning his race in 20.28, Gatlin his in 20.19, both jogging to the finish. Amid the action on the track, Gatlin’s agent, Renaldo Nehemiah, has said that Gatlin is considering a boycott of the British media. Candidly, such action would be fully justified. Generally speaking, their treatment of Gatlin has not just been unfair; it has been mean, indeed venomous. If much of the British press has collectively decided they have no obligation to be fair to Gatlin — never mind the possibility, no matter how remote, of complimentary — then why would he have an obligation to interact with them? As Nehemiah said after Sunday's race, in the tunnel underneath the Bird's Nest, "I feel badly about it because the human element is presenting itself in an ugly way. It’s really unfair." Gatlin is the Athens 2004 Olympic 100 gold medalist, and Nehemiah said, "I just marvel at how prior to his ban and return, everybody loved him. He is a nice guy. He has never changed. Certain people in the media world paint him as an ogre. I’m like -- do you even know this man?" To quote Dr. Martin Luther King Jr., in a different context but with words so apt here: "A boycott is never an end within itself. It is merely a means to awaken a sense of shame within the oppressor but the end is reconciliation, the end is redemption." In this instance, an elemental truth ought to be so patently obvious: we do not live in a world where ogres are real, where we have to make up cautionary fairy tales masquerading as "morality plays." The truth itself is good enough, and the truth is that we live in a world that is not binary, not black and white. We live in a world of multilayered grays. To portray Bolt as “good” and Gatlin, twice banned for doping, as “evil,” is thoroughly and dramatically irresponsible. Four other guys ran in the 100 semifinals with time off for doping matters: Tyson Gay, Mike Rodgers, Femi Ogunode and Bolt’s own teammate, Asafa Powell. The Jamaicans named Powell a team captain! None of them got anywhere near the same level of vitriol Gatlin did. Why? Because Gatlin is faster? "It was inevitable that some would hail this a victory not just for Bolt but for clean athletics. It was understandable too, given Gatlin’s past – which includes a four-year ban for taking the banned steroid testosterone – and his startling present, which has seen him set personal bests in the 100m and 200m at 33. "The danger is that it is both simplistic and lets other athletes off the hook. Remember 66 athletes at these world championships have served doping bans – including four in the 100m final. One victory from an athlete who has never tested positive will not change that." This acknowledgement, too, from Tom Fordyce, the BBC's chief sports writer: "This was never good vs evil, as some tried to bill it in advance. Gatlin is a dope cheat, not a serial killer or child abuser." British legend Steve Cram, who has a lifetime of experience in the sport, both as athlete and broadcaster, shouting on the air for the BBC about Bolt’s victory as the Jamaican crossed the line, “Usain Bolt — it’s very, very tight but I think he has done it! He has saved his title, he’s saved his reputation, he may even have saved his sport. A super-hero, if he has won it. He is looking up. Usain Bolt, three times world champion! There is so much hyperbole there one hardly knows where to start. Elsewhere in its pages, The Guardian quoted Cram in the second paragraph of another story on the race, under this headline: “Usain Bolt beats Justin Gatlin to 100m gold in ‘clash of good against evil’ "
The best — the very best — that any of us can say about Bolt, who has been a charming and irrepressible champion since his first Olympic gold here at the Bird’s Nest seven years ago, is that he has never tested positive. For his part, Gatlin is not “evil.” That is over-the-top ridiculous. Gatlin is a good guy. He got tagged twice for doping positives. The first, in 2001, came when he was 19, and was for Adderall, the prescription medicine he was taking for the attention-deficit disorder with which he had been diagnosed 10 years before. The second, in 2006, was for testosterone, and under circumstances that have never been fully explained. The evidence in the matter does not corroborate the story that a massage therapist rubbed steroid cream on Gatlin; that, according to a read of the record, was first suggested by Gatlin’s then-coach Trevor Graham, whose credibility as a central figure in the BALCO matter has to be viewed dimly. A more likely, if unproven, explanation is that the positive test came from a shot or a pill delivered while Gatlin was under the direct watch of Graham and assistant coach Randall Evans. This unequivocal acknowledgment: the rules make it plain that Gatlin was liable for what’s in him, however it got there. The rules were followed. Gatlin was sent away, into the wilderness, for four long years. A read of the transcripts in the 2007 hearing that followed the 2006 test makes plain — from investigators to the arbitrators themselves — the belief that Gatlin did not knowingly ingest anything illicit. When he found out he had tested positive, moreover, Gatlin immediately sought to help federal investigator Jeff Novitzky in Novitzky’s investigation of BALCO, agreeing to make undercover phone calls to Graham. Yet the dozen or so calls Gatlin made got him no credit in his doping case — the rule at the time said that any such “substantial assistance” had to lead directly to an anti-doping agency “discovering or establishing” doping by another person. Since that didn’t happen, Gatlin got no break. You can maybe understand why that might -- to those who have long supported Gatlin -- seem a disconnect. Gatlin is a good guy who, when notified he had a problem, tried his very best to help the good guys do the right thing. And what did that get him for his effort? Nothing. How does that ring in the balance of equities? The thing about rules is this — without reference to real life, rules can easily become unjust. This is why the call for lifetime bans is so tiresome. Sports officials know this full well. Such bans come loaded with an assortment of challenges, including a violation of basic human rights. The International Olympic Committee president, Thomas Bach, reminded one and all of this very thing just last Friday, at a news conference here. We live in the real world, everyone, not a world of judgment and moral high-mindedness where a young man with transgressions in his teens and early 20s has to live, re-live and keep living the past. Gatlin, again, is now 33.
Who among us has not done things at 19, or 24, that they wish they could replay? Where is that understanding? Where in the coverage was any attempt to portray the heartbreak Gatlin felt in 2006, and thereafter? Or the courage it took to remain true to one’s self for the long years he was out of the sport, then the several more it took to build back to world-class speed? Or Gatlin’s incredibly strong family ties — how his mother and father have been with him throughout the ups, the downs, everything? That’s also why the heckling of his mother was so very wrong. Or did it cut against the easy caricature of Gatlin as “evil” to write that, in fact, he is a real person, and that each and all of us are on a journey in life fraught with mistakes. Let the words of Dr. King, as ever, ring out. The beauty — for Justin Gatlin, for all of us — is that life also offers opportunity and redemption. When Justin Gatlin first got the news — this was nine years ago — that he had tested positive for the banned substance testosterone, he literally fell out of the truck he was driving. Justin Gatlin is assuredly not dead, and his track and field career is now the farthest thing from over. For the past two-plus years, Gatlin has been the best sprinter on Planet Earth, the fastest guy anywhere anytime. Many experts expect him not only to challenge but to defeat Usain Bolt in the 100 meters at the world championships, which begin this weekend at the Bird’s Nest in Beijing. And maybe the 200, too. "That's what everyone is waiting to see," Maurice Greene, the Sydney 2000 100 gold medalist, said Friday. Here in Beijing as a television commentator, Greene added, referring to Bolt, "How prepared is he? Because you know Justin is prepared." That 2006 test was Gatlin’s second go-around with the doping authorities; he would end up being banned for four years. The first test came in 2001. Because the facts and circumstances of both tests have been not just under-reported but thoroughly misunderstood, Gatlin has become to many with an interest in track and field something like Public Enemy No. 1 — particularly when compared, as he often is, to the larger-than-life Bolt. The British press in particular has been given to depicting the races here in Beijing as a clash of "good versus evil." At a news conference Thursday, Bolt was asked if he was the "savior" of track and field. He said, speaking generally, not referring to Gatlin, “People are saying I need to win for the sport. But there’s a lot of other athletes out there running clean, and who have run clean throughout their whole careers. I can’t do it by myself. It’s a responsibility of all the athletes to take it upon themselves to save the sport and go forwards without drug cheats." The curious thing is that Justin Gatlin is the farthest thing from loathsome. As Greene said, referring to both Bolt and Gatlin, "Take out everything that has to do with sports. They’re both good guys." David Oliver, the U.S. 110-meter hurdles standout, said about Gatlin, "I'm rooting for him and I hope he does well." Gatlin comes from a strong family. His father, Willie, served with distinction for more than 20 years in the U.S. military, a Vietnam veteran, and the son wears the red, white and blue national uniform with pride. Justin Gatlin is great with kids and with track and field fans. When he got tagged in 2006, his first instinct was to cooperate with the federal government in its BALCO investigation, which he did extensively. Since coming back to the sport five years ago, he has not tested positive, and be assured that he is a marked man. The question now is, if you allow for the very real possibility that Justin Gatlin is indeed running clean, can he run this week in Beijing for redemption? All things are possible in sports, and particularly track and field, which for years has been bedeviled by doping. But what if -- what if -- Gatlin is, despite all the well-earned skepticism about the sport, running clean? In an interview, he said, “I think that for so long I have shut down because of being beat upon by the media, [believing] if I say less it will go away. I’m wrong. The many critics of track’s doping rules say, often citing Gatlin, that two strikes should mean a lifetime doping ban. But the rules say, unequivocally, that Gatlin is allowed to run. It's not difficult to understand why the concept of a lifetime ban might seem so appealing to so many. But theory is not real life. And it is the case that when applied to life as it is — how Justin Gatlin came to test twice — a lifetime ban would be cruelly unfair. — Gatlin’s first flunked test, in 2001, was for medication he had been taking for attention deficit disorder, a condition he had wrestled with since he was a young boy. Gatlin, at the time still a teen-ager, tried to follow the rules. Nonetheless, he came up positive. — The second test, at the Kansas Relays in 2006, has long sparked controversy because of the assertion in Gatlin’s camp that a masseuse rubbed steroid-laced cream on Gatlin, sparking the doping positive. A reading of the record strongly suggests that story came from Gatlin’s former coach, Trevor Graham, whose credibility — amid his extensive involvement in the BALCO scandal — has to be viewed with extreme suspicion. A more likely, if unproven, explanation is that the positive test resulted from a shot or a pill described at length in the testimony. “At the end of the day,” Gatlin said in an interview at his training base in Clermont, Florida, near Orlando, “the irony of the situation is I really do want the sport to be in a better place outside of everything that has gone on in my life. Justin Gatlin has run fast for a very long time. In high school in Florida, he was a state champion sprinter. That earned him a scholarship to the University of Tennessee. There he was a multiple NCAA champion. At the 2001 junior nationals, when he was 19, Gatlin tested positive for trace amounts of amphetamine. At UT, Gatlin was taking two summer school classes he needed to stay eligible: English 101 and Music History 350. In both classes, he had midterms the week of June 11, 2001, just before the junior nationals. Gatlin took his Adderall to help him stay focused while studying for his midterms. He stopped taking it three days before running — why three days, exactly, instead of four or five or two or whatever, remains unclear. In the sample Gatlin gave on June 16, 2001, authorities detected trace amounts of amphetamine. A sample he gave the next day, June 17, contained even smaller amounts, consistent with Gatlin having stopped taking the Adderall on or before June 13. The rule in doping matters is that an athlete is strictly liable for what is in his or her system. The standard ban in those years for a first doping offense was two years. Gatlin got two years. He then petitioned the IAAF for a reduction, citing “exceptional circumstances.” Granted. He served a provisional suspension of almost one year. Gatlin left UT in 2002 and turned pro. He started training in Raleigh, North Carolina, with Graham’s Sprint Capitol group. At the 2003 world indoor championships in Birmingham, England, Gatlin won the 60-meter dash. At the 2004 Athens Olympics, Gatlin won the 100, in 9.85 seconds. He took third in the 200, in 20.03. He also earned a silver as part of the U.S. 4x100 relay team. At the 2005 world championships in Helsinki, Gatlin won both the 100 and 200. When Gatlin first connected with Graham, Gatlin’s parents were acutely concerned that Graham not only train Gatlin but, more broadly, look after their son. “And all that was said at that time was, are you sure nothing is going to happen to Justin?” his mother would testify, recalling their first conversations with Graham. “Are you going to make sure that he doesn’t get involved in all this other stuff,” meaning doping, “that, you know, my husband was reading about on the Internet, and I was reading about on the Internet. On April Fools’ Day 2004, a prank circulated on the web that Gatlin had tested positive. “Go ahead,” the lawyer questioning her said. Track and field has a distinct rhythm to the outdoor season. Athletes build toward summer, which three years out of four brings either a world championships or Summer Games. The Kansas Relays is an early-season fixture on the circuit, a three-day meet held every almost year (since 1923) in April. On April 22, 2006, Gatlin ran in the 4x100 relay at those Kansas Relays with his Sprint Capitol teammates. They won, in 38.16. On July 29, Gatlin announced to the press that he had tested positive for testosterone at the Kansas Relays. Two mysteries relating to the 2006 test have long endured. The first is what authorities thought they would find — that is, why bother to test — at such an early-season affair. The second is why it took so long — three months, April to July — for the test from those Kansas Relays to become what’s called, in the vernacular, an “adverse analytical finding,” or a doping positive. Gatlin’s sample initially produced a negative result — meaning he apparently was clear — under what’s called the T/E ratio test, the standard test used both in- and out-of-competition to screen for testosterone. Indeed, Scott said, Gatlin’s sample was originally reported to USADA as a negative. 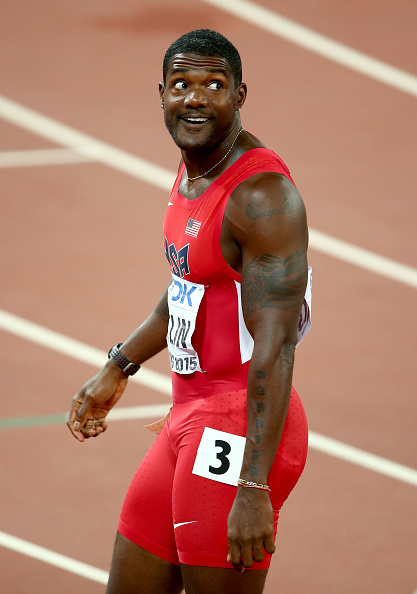 The lab did as asked, and concluded that Gatlin is what’s called a “low-mode individual,” who — to make it simple — lacks a particular enzyme, with the effect that the T/E ratio is typically very low and does not much change if that individual is administered “exogenous testosterone,” from a source outside his body. The lab told USADA Gatlin was low-mode. “I am not aware of whether we recommended or USADA requested that a Carbon Isotope Ratio test be performed,” Scott said, referring to a test that is both far more sensitive and way more expensive, in the range of several hundred dollars. In June 2006, the lab performed the CIR test. Bingo. A positive test. Why did USADA ask for the further analysis that led to the positive? At that same 2003 world indoors at which Gatlin won the men’s 60, Michelle Collins won the women’s 200. Her 22.18 would have been an American record but it was never ratified. Instead, after being linked to the BALCO matter, she admitted using illicit substances. Ultimately, she would get a lengthy suspension. She last trained with Graham in 2001, before Gatlin met up with Graham, the legal document stresses. USADA “considered this information provided by Michelle Collins and decided to test at the 2006 Kansas Relays, an event at which it had not previously tested,” the document says. In late 2005, USADA notified USA Track & Field and Kansas Relays organizers it would be testing that next April at the meet. Gatlin was picked for testing after his relay team won first place; he had run the anchor leg. “This selection” for testing “was in accordance with USADA’s routine selection criteria for track and field relay events,” the document says. When he was on the road, Gatlin had a reputation as the room service king. On June 15, 2006, the room service king, ever careful, learned in a three-way call — with his agent, Renaldo Nehemiah, and his parents — that he had tested positive at the Kansas Relays. She also testified, “Not only has my child, Justin Gatlin, suffered and [is] still suffering, his name, his reputation. We have all suffered. We have all suffered. I have — I’m bald, not by choice. This is the haircut that anybody that knows me has never seen on me before. I have long hair. My hair was coming out in clumps. I had to go and have my hair cut off through the stress of this. I have never suffered high blood pressure before until this. Nehemiah testified that the second test cost Gatlin “5, 6 million dollars.” Gatlin, Nehemiah said, had grossed $1.549 million in 2005; projections in 2006 alone, the agent said, were for “anywhere from $2.5 to $3 million” in 2006 alone. Owing to the positive test, Nehemiah said, Gatlin’s 2006 gross: $280,235. “Did he embrace that burden?” Nehemiah was asked. Jeanette Gatlin continued: “You know, he’s suffering,” referring to her son. “He doesn’t know where he’s going to get another paycheck, what’s going to happen and how he’s going to continue to live. Justin Gatlin spoke as well with Jeff Novitzky, the-then federal agent running the BALCO inquiry. On August 16, 2006, Gatlin met with Novitzky for five and a half hours in New York, voluntarily traveling to the meeting from Florida. At the end of that interview, Novitzky asked Gatlin to make undercover phone calls to Graham, as a means both to judge Gatlin’s credibility and to potentially gather evidence against Graham. In all, Gatlin would make roughly a dozen calls to Graham and Randall Evans, an assistant coach. Throughout, the authorities viewed Gatlin as a cooperating witness. Novitzky would testify as well. “Well, did you ask him if he used any prohibited substances? “And what was his response to that?" “His answer was no, never knowingly." Thus the core question: what happened that prompted the 2006 positive test? The dog-ate-the-homework theory that got advanced is that masseuse Chris Whetstine rubbed a cream containing steroids on Gatlin. Gatlin, in testimony, referring to Graham: “He said that he went and looked at the Internet to find out what the cream was that he thought Chris Whetstine used, and he came across DHEA,” banned as a testosterone precursor. Why, he was asked, put so much weight on what Graham would assert? Gatlin was asked, did you see the tube Whetstine had? No. Did you ask to see it? No. So, “you didn’t hear about the tube with the squiggly S on it until after you had been reported positive, correct?” Yes. “… And the only person that you heard that from was Trevor Graham, correct?” Yes. Graham did not testify in this hearing. Nor, for that matter, did Evans. Referring to Graham, Whetstine said, “Well, golly, I thought I was … I mean, in 2006, I would have to say it was probably the best year in our relationship that we ever had. We would go on long walks together, talked about politics, religion, he showed an immense amount of concern for Justin Gatlin in trying to keep him on focused [sic] and on track, so that we could attain our goal." “Do you have any knowledge of how Justin Gatlin tested positive?" “Did you apply any prohibited substances to Mr. Gatlin?" “Did you apply testosterone cream to Mr. Gatlin?" “When you heard of Justin Gatlin’s positive tests, what came to your mind as the possibility of how this occurred?" “I had no idea. I had no idea how it could have occurred." “Did you do any introspection as to whether anything you did might have caused this?" “Well, I knew that nothing that I did would have inadvertently caused it." “Have you heard of Sarati Laboratories?" “Have you heard of a cream, Deep Hydrating Essential Aloe Cream?" “Did you ever have any tubes that were white tubes with pink squiggles or stylized letter S's on them?" “No. I can provide you a little insight into — I’m going to step out on a limb here, and call it Mr. Graham’s alibi. And let you know — I want to be careful, because I don’t want to be inflammatory. “I’m a pretty big supporter of Justin Gatlin, and I don’t want to believe that Justin did anything wrong, OK? “But in the light of the truth and fairness, where they’re concocting this story from is that my sponsor Biotone, OK? There’s a — I am given a product to distribute from Biotone, BioFreeze, to athletes and therapists; not only therapists that are under my direction, but other therapists, who would be, you know, ostensibly of some notoriety, if they were to be making a plane trip from one place to another. “And one of the bottles that Biotone has — I think it’s called the Dual Purpose Massage Cream, a product that I don’t use. I use an oil, which I may have already described in my testimony. And this Biotone Dual Purpose Massage Cream has a pink band on it. “And so, somehow, they have leapt from the Prefontaine Classic," an annual track meet in Eugene, Oregon, "which is probably, I think, June 7th — some time in early June when that product first showed up for distribution to my staff, courtesy of Biotone, and something that they claim that happened months prior. “It’s a product I don’t even use. It’s solely for distribution to my staff." “… But you don’t know that the Dual Purpose Massage Cream that you have described contains any prohibited substance?" “If that were the case, every athlete at the Prefontaine Classic that year would have tested positive." “Why is that so? Because you said you don’t use it." “Because I distribute it to 17 other therapists. I give out a goodie bag that has all Biotone and Biofreeze products, PowerBar and literature from StrongLite …"
Whetstine also testified that in May 2004, he went with Evans to a pharmacy in Monterrey, Mexico, where he — Whetstine — bought Voltaren cream, an Advil-like anti-inflammatory that is not uncommon in American track and field circles, even though it’s not typically available in the United States. At a different point in the hearing, Whetstine was asked by another of the arbitrators to elaborate. “You made a reference to Randall Evans purchasing testosterone in Mexico?" “Do you know what he was using that testosterone for?" “Well, he told me it was for sexual performance. I don’t care what he was using it for. I was furious. He — I was livid." “No, this was in 2004, yeah, because he was in Mexico in 2003 and we went back in 2004. And as he was purchasing two packages that had 8 vials apiece. I mean, he was saying it was for topical application for sexual enhancement. And these were bottles — you know, like they have the — like a skinny neck, like a tight neck with a — like an aluminum cap? And that to me means that — that’s like what you see in the hospital. I mean, that’s something that you can inject in somebody. “And I was furious. And as he was paying for it, I left. I wanted nothing to do with that and told him so. Made sure that I was not in the airport with him, that we left on — you know, did not arrive at the same time for our departures, called my girlfriend — actually, on Justin Gatlin’s phone, called my girlfriend, expressed that I was furious. “And she inquired about it, and you know, I get — it does have some levity to it. She said, well, if that’s what he’s saying, honey, you don’t need any of that stuff. I mean, she was joking with me." “So why were you furious?" “I was extremely furious at why — you know, I was furious." “He’s buying testosterone, sir. That’s a prohibited substance. I don’t want any exposure or knowledge of anything." “So I mean, were you — did you consider that he was buying it for other athletes?" “I didn’t care what he was doing. I didn’t want him doing it in front of me." “When you say it’s a prohibited substance, I’m a little bit — it was legal for him to buy that in Mexico, correct?" “I don’t know. You know, the story is you can get whatever you want in Mexico, and his wife is Spanish. He actually says his wife works for the FBI, was his claim, and she was an FBI agent and was bilingual, and so, I guess he had some lingo, but — what was the question?" “But if he was buying it for other people, it seems to me — especially for athletes — that would be a valid reason for being furious." “Sir? My integrity, hard work and my word are all that I have to go on in this business. I do not want to be exposed to, have knowledge of any illegal activity, OK? And I don’t care what he’s buying it for. I don’t care what he’s buying it for. OK?" Gatlin had long had problems with tweaky hamstrings. That was the case in the spring of 2006. HIs right hamstring was not responding. Red blood cells take oxygen to the muscles. When the body can’t make enough red blood cells, one response is to take vitamin B12. Taking the vitamin B12 orally was not doing the job, Gatlin testified. So he asked a doctor what to do; the doctor recommended a B12 injection directly into the hamstring itself. It is also the case — well-known in the appropriate circles — that administering testosterone directly would help in recovery. Who, Gatlin was asked on the record, did he talk with about the prospect of getting a B12 shot? Graham, Evans and, as well, another sprinter who at one time was in the Sprint Capitol camp. On April 6 or 7, Gatlin testified, he got a shot of what he believed to be B12. At his house. From Evans. With Graham in attendance. Whose idea was it, Gatlin was asked, to get a B12 shot? To ask the doctor about such a shot? A B12 injection comes as a clear red liquid solution. The red is vivid. Crucially, Gatlin was never asked whether that B12 shot was red — neither by his own lawyer or on cross-examination. Moreover, B12 injections are typically administered via the buttocks or shoulder, areas less susceptible to pain. The day after the B12 shot, Gatlin did testify, he took a Voltaren pill — supplied, he said, by Evans. The pill and shot came about a week before the Mt. SAC meet in California. There, Gatlin ran a relay leg; his team took second. A week later: the Kansas Relays. After Mt. SAC, Gatlin testified, he felt like he was back to 100 percent. Again, Evans did not testify. Nor did the doctor. Objections came from both Gatlin’s lawyer and from government attorneys, and the question never did get answered. During that interview, Gatlin was asked to describe the pill. “We came to find out later, much later, months, maybe a year later, that he told someone else that the pill was brown, and brown is the color of these testosterone and Decadron pills, so we had some concern about that. Nehemiah, saying he was seeking answers to how Gatlin could have tested positive, commissioned Heredia to write a report. The report, after much negotiating, cost $10,000. But because of an accounting glitch, Heredia got paid $10,600. “The Memo memo,” as it came to be called, ultimately made its way to Novitzky. From the agent’s point of view, the concern was simple: the government had no idea initially that Gatlin’s entourage had retained Heredia. “This was all unbeknownst to us,” Novitzky said. “He didn’t — we found out about this second-hand, not from them. And that was a big issue toward us, in terms of, you know, cooperation and credibility, because typically, when we’re dealing with cooperators and looking at these issues, you know, one of the issues with a cooperator is full disclosure of everything. It might be reasonable to assume that Gatlin would — in his own case — get some benefit from cooperating with Novitzky and the feds. In fact, he got none. Even so, the rule at instance was super-precise: “substantial assistance” had to result directly in an anti-doping agency “discovering or establishing” doping by another person. Yes, Gatlin cooperated, USADA acknowledged; yes, he took considerable risk; but, no, the dozen or so phone calls didn’t lead directly to any such violation. It gave him four years off. A 2008 review by another three-member panel, this one from the Swiss-based Court of Appeal for Sport, left it at that: four years. Those four years, Gatlin said in an interview, were miserable. He moved to Atlanta and, to make money, taught sprinting to 8-year-olds. He also said, “I was so depressed, Me, my mother and my father, we are a core. We became stronger when i went through my ordeal. Going through the ordeal broke us down. My mother lost hair. For a woman, that’s a big thing. She prayed every day to the point where she was like, what is prayer doing? Nothing is being answered! She doubted her faith. As for Justin Gatlin himself, during those four years, he said, “I think that’s where track Justin met real Justin. “It’s not a cliché to speak in the third-person sometime. I have to tell you how I experienced it. I didn’t see any worth my life. I wasn’t running. I wasn’t being acknowledged. I was looked upon as the bad guy. I was ready to enlist in the Army. I was ready to become a police officer. This is real: if I die, if I took a bullet, at least I took it for something I believe in — America. It was with that attitude that Gatlin came back to the sport in 2010. He worked himself back to a bronze at the 2012 London Games in the 100, behind Bolt. The turning point came the next year, at the 2013 worlds in Moscow. The 100 went down in a pouring rainstorm. Bolt won, again, in 9.77, crossing the finish at the precise moment lightning flashed across the sky — an incredible, indeed indelible, picture. That frame also shows Gatlin. He is behind Bolt, and to the Jamaican’s left. Gatlin would finish second, eight-hundredths back, 9.85. To do so, however, he had to submit — to his coach, Dennis Mitchell. Gatlin said he had to accept Mitchell’s word as gospel, to let technique do the work for him in his races. 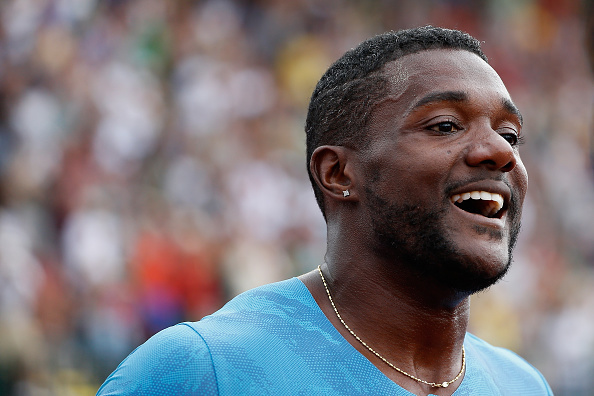 Until that lightning flash in 2013, Gatlin said, he had — whether consciously or not — been trying to do it his way. From that moment on, he said, it has been Mitchell’s way. Mitchell typically draws a torrent of criticism from those who know he, too, tested positive during his days as a champion sprinter. There’s a back story there, though. Mitchell tested positive for what he relates as inadvertent use of DHEA. But who voluntarily testified for the government in its investigation of Graham? Among others, Mitchell. Mitchell said, "I testified under oath in front of the feds that Trevor Graham coerced me into taking growth hormone." “I was a witness for the good guys,” he added. “I wasn’t prosecuted. I wasn’t threatened. I wasn’t put on trial for lying. I was a 20-minute witness for the federal government, against Trevor Graham, to tell everything about my life and his life that would incriminate him. That’s what I did. And I took a hit for the good guys. “And I knew that when I did that, either the sport was going to herald me as a good guy or they were going to kick me out as a villain. I rolled the dice. I said,’Dennis, everything you have been through in the sport, all the great achievements you have had in the sport, the sport will not turn its back on you.’ "
Doing what Mitchell says, Gatlin has not lost since the end of 2013. This year, he has run 9.74 in the 100, 19.57 in the 200. The American records: 9.69 (Tyson Gay, Shanghai, 2009), 19.32 (Michael Johnson, Atlanta Olympics, 1996). Under Mitchell's direction, Gatlin has lost roughly 30 pounds; the science of sprinting increasingly has come to recognize that leg strength -- not being top-heavy -- is what counts. He also has worked in the weight room to re-make his slimmer self and at improving his start. "I wear medium shirts now," Gatlin said of his weight loss. "A large would be hanging off." "Any person who has watched this kid, who knows track and field, can see the technique changes," Mitchell said, adding a moment later, "2014 is the year he woke up smart. He put his mind to it and went for it." As an example, he said, “If you look back at all the races I have had just this year, if you look back with a careful eye, you will see difference. From the 19.68 I ran,” a 200 last July 18 at a Diamond League meet in Monaco, “to the 19.57,” this June 28 at the U.S. nationals, "the end of my race and my last 100 meters was way more relaxed, way more turnover. In his home bathroom, Gatlin said, he has hung what he calls a “vision board,” posts of what he wants to achieve. On the board, he said, are the times 19.30 and 9.68. Anything is possible in track and field, which for years and years has been marred by doping, and at the highest levels. As difficult as it may be for some skeptics, indeed cynics, the matter is straightforward: to believe that Justin Gatlin is doping is to believe he does not want to go through that door. To assume that Gatlin is cheating is to believe he would risk his new Nike deal. Mitchell, too, has a new deal, and he and his wife have a baby. The mortgage gets tough to pay when there's no income. Beyond all that, to believe that Gatlin is doping is to say he wants to stumble back to the wilderness — lost, angry, the sort of son who would disrespect his parents, who would make his mother’s hair fall out again, who would risk the certainty of a third strike and a lifetime away from the very thing that gives him so much joy, indeed meaning, in life. Which seems more logical? Which more reasonable? “I found me,” Gatlin said of his four years away. He said, “I had to step back and realize, you know, just because everyone doesn’t agree with what I am doing doesn’t mean they are against me.